These 19 snapshots show members of the 1951 Topeka Mosby-Mack baseball team. The team represented Capitol Post 1 in the American Legion baseball program, but took its name from its sponsor, the Mosby-Mack Ford dealership. The Mosby-Macks finished second in the American Legion's state championship tournament held in Russell. The photographs were taken at two different locations. The first seven images were taken at the Washburn Rural High School diamond (at that time located at 19th and Hope in Topeka). The others were taken at Owl Park, home of the minor league Topeka Owls, but also used for many of the Mosby-Mack games. The player shown in the first image is Tom Sleeper; the names of other individuals are marked on each photo. In addition to Sleeper, the players include: Marvin Bean, Adam Engroff, Jim Golden, Earl Graham, Edgar Graham, Jim Humbert, Ralph Luce, Bob Morris, Paul Packer, Bob Shirley, Bob Smith, Bob Walden, and Ted Worthington. Coach Bob Perry and manager Cliff Fawl are also pictured. 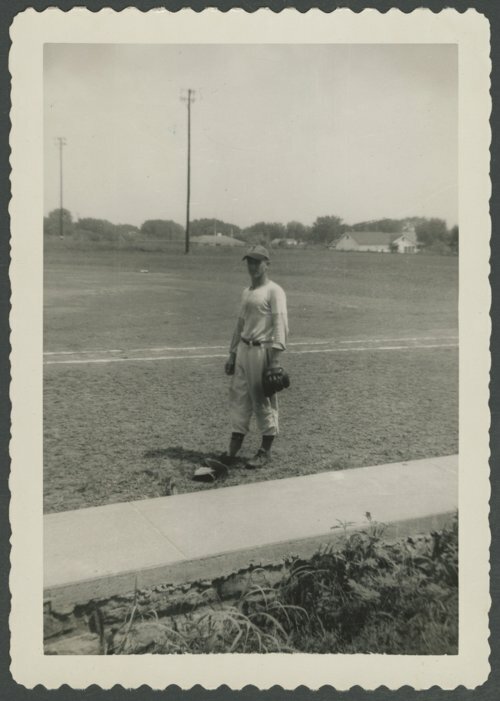 The snapshots appear in a scrapbook documenting the baseball activities of Topekan Paul Packer, a member of the 1951 Mosby-Mack team (see unit 307687). Digital reproduction of the photographs was accomplished through a joint project sponsored by the Kansas Historical Society and the Shawnee County Baseball Hall of Fame.